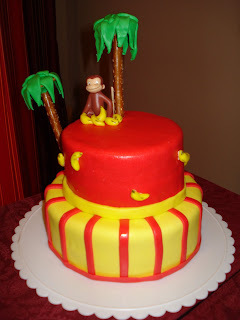 My nephew Quinn requested a "monkey cake" for his third birthday and this is what I created!! This is my second attempt at a fondant cake. I used a marshmallow fondant recipe and it was so much easier to work with. The cake was a lot of fun to create. Everything was edible except Curious George. 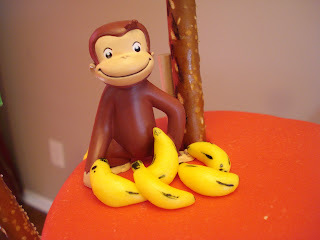 The bananas were handmade from fondant and the tree's were created with fondant and pretzels. This is a cake that turned out better than I thought and was a hit at the birthday party!